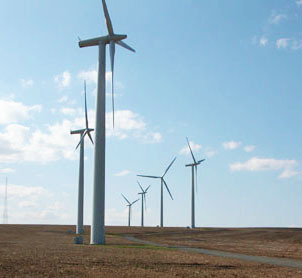 Harvest Wind is PenLight’s wind farm located near Goldendale, Washington. PenLight partnered with three other Northwest public utilities to construct this 98.9 Megawatt project, and has a 20% ownership share in the project. This project was completed in December 2009, and has 43 wind turbines that collectively can provide renewable power for over 23,000 homes. Harvest Wind qualified for a U.S. Treasury Department grant for a portion of its construction costs; these funds were made available through the American Recovery and Reinvestment Act of 2009. The total project cost after the grant was $160 million. PenLight meets its state obligation for renewable energy under Initiative 937 (I-937) with Renewable Energy Credits (RECs) generated from Harvest Wind. I-937 requires utilities with over 25,000 consumers to have an increasing portion of their power come from renewable energy: 3% (2012–2015), 9% (2016–2019), and 15% (2020 and beyond).